Disclosure: I received a discount during my stay at Grand Legacy at the Park, however reviews and opinions are 100% honest and completely my own, as always. 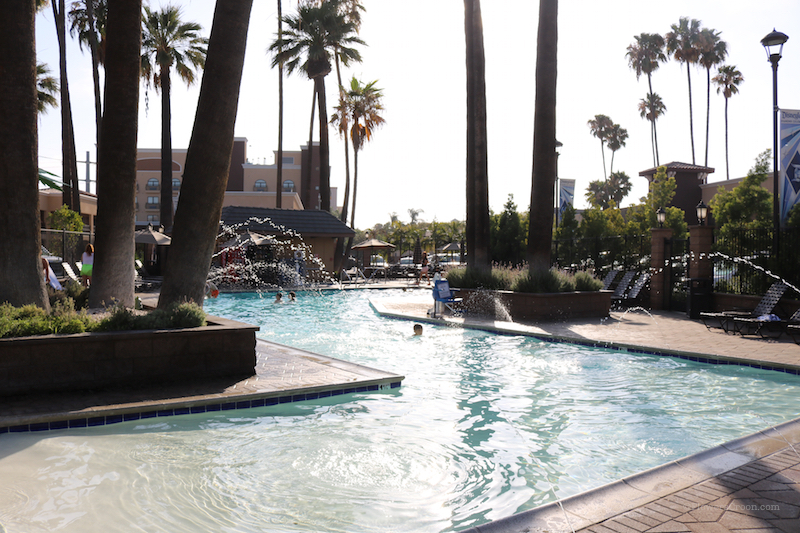 In February of 2016 Grand Legacy at the Park became Anaheim's newest independently owned hotel. You may remember the hotel as the Ramada Maingate at the Park, located directly across the street from Disneyland. With its great location and recent $12 million dollar investment in development and renovations, we knew this would be the perfect spot for my daughter's Fourth of July birthday trip. It was also a great opportunity for me to scope out a new property for my next runDisney racecation! We arrived at 2:45 AM and were tired from the 4+ hour drive from the Bay Area. Thankfully check-in was a breeze. The agent was helpful and had everything ready for me very quickly. I booked a Deluxe class room (300 sq ft) rather than the Classic because we wanted the Queen beds instead of the Full or Doubles. When you're traveling with teens - you need space! (Tip: When booking, be sure to look at all the different room categories to be sure you're booking the right room for you and your group.) When we finally unloaded and began to settle in I was happy to find a clean, cool room. I am really thankful the AC was on as it was desperately needed with this heat wave. Breakfast consisted of: cereal, milk, juice, coffee, bagels, pastries, waffles (toaster style), hard-boiled eggs, fruit, doughnuts and pre-cooked omelettes. Tip: The breakfast area gets crowded and very congested fairly early. To save space & time have one adult grab the hot food while the other gets drinks, a table and cereal. We quickly realized everything we'd put in the fridge the night before was warm because the fridge wasn't working. I called the front desk and within 10 minutes someone in was our room resetting the fridge. It worked fine the rest of the weekend. Five minutes later we realized someone forgot to pack a toothbrush. I called the front desk again and 5 minutes after that housekeeping was at our door with toothpaste and tooth brushes. The customer service and promptness in both cases was super appreciated! As I've mentioned here at Flowers Croon before, it is really important to me that there be something separating the bedroom from the light of the bathroom and vanity. I don't like to wake up the family during early race weekends, and I am tired of getting ready by the light of the iPhone. This particular room didn't have a partition between the vanity and the bedroom, however I was able to use the shower light to illuminate the vanity area without disturbing the sleeping teens. That seemed to do the trick. The vanity in our room had only one sink, some rooms have more than one sink and I would have preferred an extra sink. The shower was a standard curved rod style shower with tub, and aside for having to wait for the hot water to heat up, we had no significant issues. Tip: If you want housekeeping to clean up - place the sign outside your doorknob indicating so (it only says "Do Not Disturb" on one side). If you want your linens changed, place the placard in your room (by the TV) on the bed indicating so. I didn't realize I had to do this so housekeeping didn't do exactly what I expected the second day. Also, call the front desk at anytime and they will help. They are very helpful. After our second day at the park, we picked up dinner from La Brea Bakery and headed back to the room to nap before World of Color. Well, the nap turned into, "let's go to the pool!" pretty fast. All three of the teens LOVED the pool area. Even the one who didn't want to wet her hair. ;) The pool is heated, super clean and features fun play structures for spraying your friends and a hot tub. After two extremely hot days at the parks, this was just what the kids needed. Tip: You need your room key to access the pool area & don't worry about towels - those are located by the pool. Panoramic view of the sun setting behind Disneyland and Disney California Adventure. Click to expand. Our very first night we made it back to the Grand Legacy just in time to run up to The FIFTH, the newly opened 5,000 sq ft rooftop lounge & bar, to watch the sunset. The only one of its kind in Anaheim, the views from the rooftop are amazing. I only wish my photos were as spectacular as the actual view. Wait until you see this for yourself! Definitely check out their website for breathtaking photos. We returned later that night to snack and watch the fireworks. The FIFTH features small bites - great plates for sharing - that vary from healthy grilled artichoke to classic tater tots. We chose the tater tots and mozzarella sticks. Menu may change. Please check directly with The FIFTH website and Facebook page for current menu. Being a rooftop lounge and bar means they also have cocktails and entertainment. Open from 5:30 - 11:00 PM, The FIFTH hosts bands on the rooftop that perform with the Matterhorn as their backdrop. How cool is that? The cocktail menu features fun drinks, and I was personally pleased to see an entire champagne cocktail menu. I had the Strawberry Gin Bee - a delicious infusion of strawberry, gin, honey and sparkling wine. It was very good. We enjoyed our food and the view, as well as played games. The kids loved the giant Jenga puzzle. 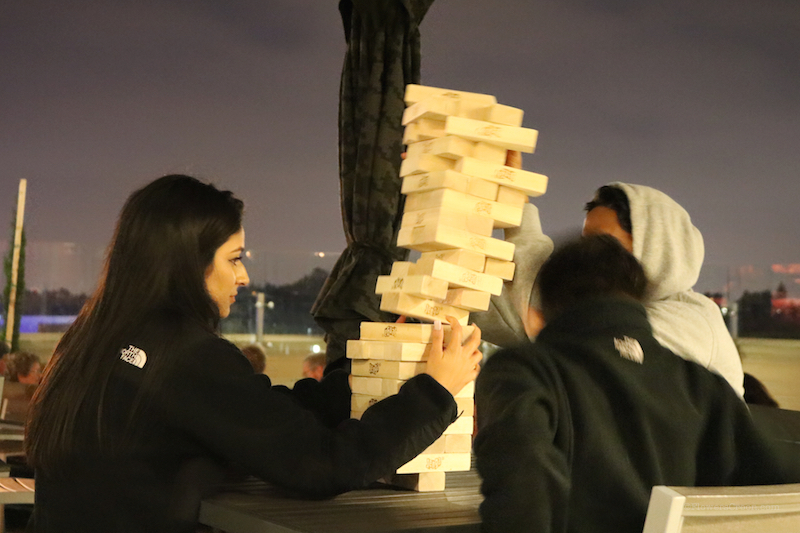 There was also a giant Connect Four - but that Jenga was all they could think about. Although the rooftop lounge is family-friendly, there is somewhat of a division between the actual walk-up bar and the family area since the bar itself is 21 and over. That is something I think most adults will appreciate. With so much room, it's nice a private space was carved out for adults. You can always cozy up to the fire pits with family and enjoy too. It's a win win and really just a gorgeous space. I would absolutely have an awesome time here with my runner friends during a racecation! Unfortunately due to wind and clouds, Disneyland fireworks were cancelled the first night of our trip - so we eventually saw them at the park rather than from the rooftop. Below is a photo which basically sums up the view from The FIFTH. Pretty epic, right? Safety: I felt safe walking back at night because the property is so close to the main Disneyland crosswalk. The room itself features standard security features such as a deadbolt lock and doorstop lock. The area is well lit, though please always be cautious as anything can happen at any time. The lobby is always accessible - you can go in if you feel unsafe. Room Rate Discount: Keep your receipt from The FIFTH! Spend $25.00 or more at The FIFTH and receive $10.00 OFF your current hotel reservation. Spend $50.00 or more, and receive $20.00 OFF your current hotel reservation. Would I recommend the Grand Legacy at the Park for your next racecation or family trip - yes, I would. CONS: Our biggest issues were with the crowd flow and lack of food by 9:15 AM at breakfast (to be fair, the breakfast area had just opened), not understanding the housekeeping procedures (a quick call down to the front desk helped with that) and the parking fees. I am not a fan of parking fees, but since I generally fly parking fees don't typically apply to me. I would return and request a room with a view of the park and bunk up with my runner friends for a fun racecation weekend. 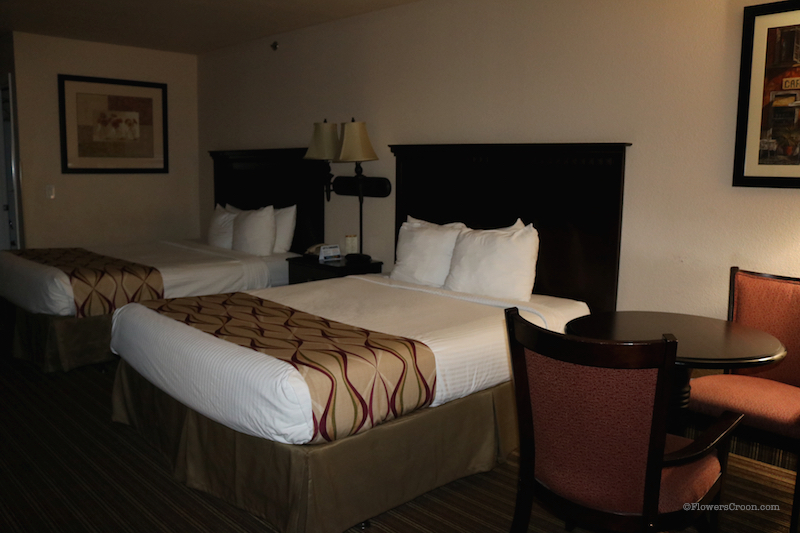 The suites are big and spacious and the rates are reasonable - especially with the AP and AAA discounts. The FIFTH is such a fun and unique touch to the Disneyland Resort area. It felt nice to be above the crowd enjoying the view, drinks and food.